Added by Indo American News on September 10, 2018. The spectacular Mohan Mahal in Rajasthan is architecturally inspired by the Sheesh Mahal. Built in the traditional Rajasthani style inside the JW Marriott Jaipur Resort & Spa, which is located amidst the mighty Aravalis is gaining popularity in the desert state, it has arches and jharokhas embellished with over three-and-a-half lakh mirrors in intricate patterns, and devoid of any artificial lighting. They serve an exquisite menu curated by the chef which has some of the most celebrated dishes of the Rajasthani culture. They give a glimpse of the royal lifestyle that the Rajasthani kings and queens had back in time. 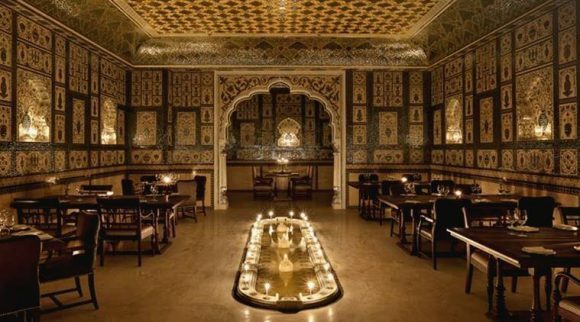 The Royal dining hall at Mohan Mahal serves their guests in silverware that glows in the golden lights of the candles. The sturdy leather bound furniture spells elegance and intricate patterns showcase regal designs.